Data Insight 1: Carriers made adjustments in 2016 to reduce their exposure to high costs. In 2016, carriers attempted to minimize their exposure to high costs by reducing the number of plan offerings that included out-of-network benefits, among other strategies. This change occurred at all metal levels and in all regions. The percentage of silver plans that were HMOs or EPOs (Exclusive Provider Organizations) increased from 61 percent in 2015 to 69 percent in 2016. 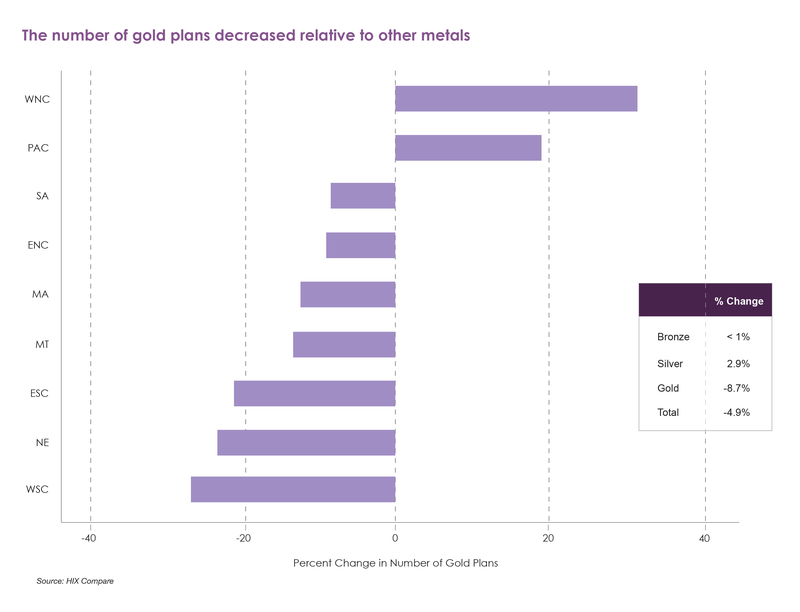 Similarly, the number of gold plans declined relative to other metal levels. While the number of silver plans increased by 2.9 percent, the gold plans declined by 8.7 percent. The number of gold plans declined in most regions. Data Insight 2: Regional variation in prices narrowed. There was a geographic convergence in premium prices in 2016, as premiums rose far more in regions that had lower prices the prior year. Nationally, the distribution of average premium prices in all rating areas tightened and the interquartile range shrank. This pattern was less straightforward for deductibles, as many combinations of cost-sharing options are on the market. Data Insight 3: Price variation within markets increased. Despite this reduced variation across markets, differences in premium prices within markets increased. The average premium price range in a rating area increased between 2015 and 2016. This was true for all metal levels and all regions. The distribution also became more skewed, as maximum prices increased more than minimum prices. In 2016, about 75 percent of the time, the highest priced plan in a rating area was offered by either a Blue or a national carrier. Data Insight 4: Large regional differences in plan design persist. Despite convergence across regions in prices, large regional differences in plan design remain. Plans in the Northeast and West have a much broader range in premium prices, and less variation in deductibles. Plans in the Midwest and South show the opposite pattern, with a smaller range in premium prices and a far greater range in deductibles. There are some changes in these patterns between 2015 and 2016, but there are still important regional differences in plan design. 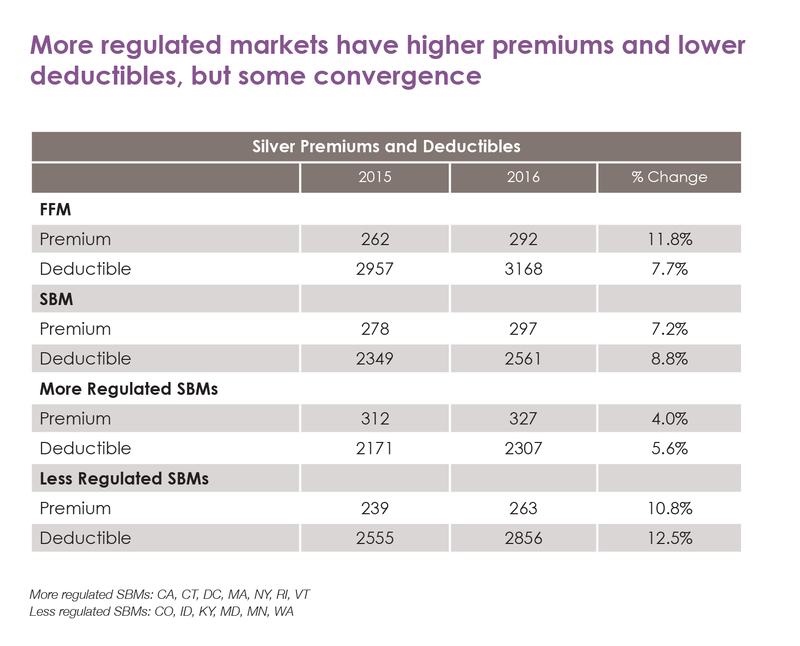 Data Insight 5: More regulated markets have higher premiums and lower deductibles. In 2015, state-based marketplaces (SBM) had higher premium prices than did federally facilitated marketplace (FFM) states, but by 2016, the average premium prices were very similar, as prices in FFM states rose an average of 12 percent as compared with 7 percent for SBM states. Deductibles were lower in SBM states and remained lower in 2016. The subset of FFMs with the greatest amount of plan regulation—CA, CT, DC, MA, NY, RI, VT—had the highest premiums and lowest deductibles of all categories. A look ahead to 2017: What can we expect? More product changes are likely. There is room for further reduction in broad network plans, and most new entrants in 2016 offered primarily narrow network products. This will probably continue to vary regionally. We may also see further reduction in gold plans, although carriers must sell both gold and silver. There are also indications that some carriers may reduce their bronze offerings. The number of bronze plans increased very little in 2016, and we may see reductions in some markets in 2017. 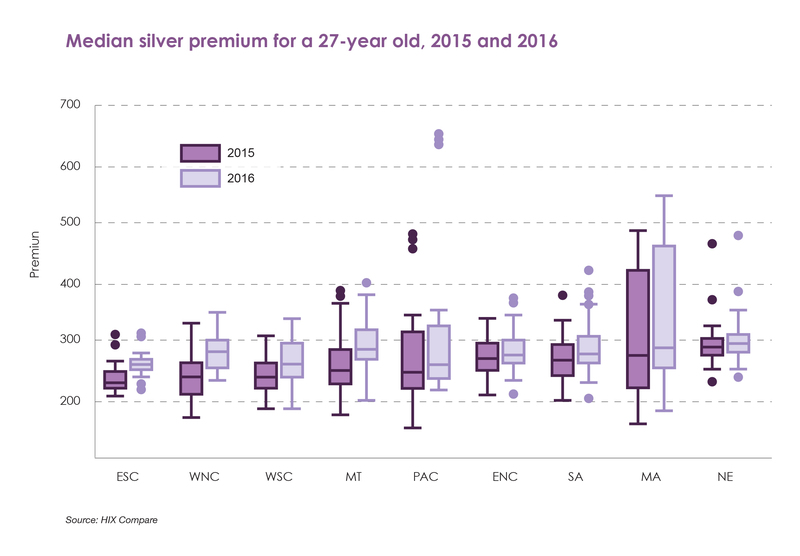 The actuarial value of bronze and silver plans seems to have grown closer in 2016, and average prices are quite close in many regions. While carriers have generally resisted government calls for standardization and simplification of plan offerings, perhaps the industry is standardizing itself to an extent through some potential reductions in product offerings. Premium prices will further converge. While overall premium increases are expected, there are still regions that are relatively underpriced, and further reduction in regional differences will probably take place. Prices may ultimately converge at the levels seen in more regulated SBMs, which may be more appropriately priced. Weaker markets may face more challenges. Weaker markets are smaller, largely rural and are characterized by less carrier participation in 2016, fewer plans and lower premium prices. These markets may experience higher premium increases and continued low carrier participation, which will inhibit enrollment gains. UnitedHealth Group’s marketplace exit will continue to be watched closely. UnitedHealth Group announced that it will exit 26 markets, participate in three, and has not yet announced a decision about five others. 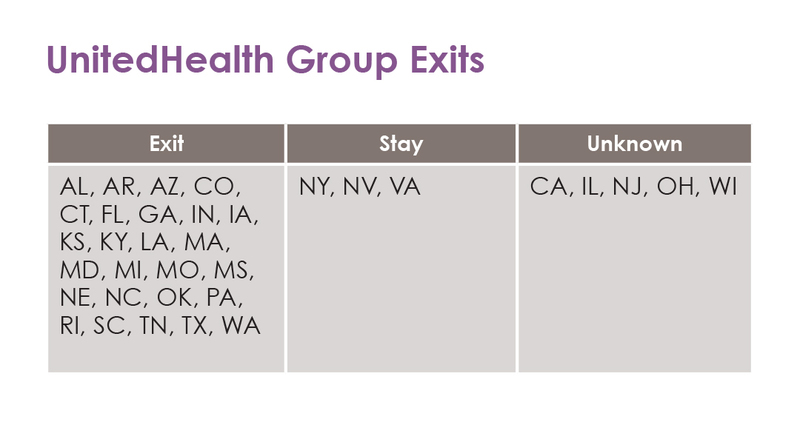 There are clear differences between exit states and the states where UnitedHealth Group either will or may participate in 2017. In states where UnitedHealth Group is exiting, the insurer was priced relatively lower than others, and there tended to be a higher-priced Blue plan in the marketplace. Exit states had characteristics of weak markets–fewer plans, less growth in the number of plans, a smaller range in premium prices, and below average premiums—despite average or above average premium increases between 2015 and 2016. The weak market problem. UnitedHealth Group may have concluded that due to the small size and low level of activity in certain markets, there would not be sufficient additional enrollment to offset negative claims experiences, and that it would be difficult to raise premiums sufficiently to stop losing money with current enrollees. If other carriers approach marketplace decisions in a similar way, it suggests that weak markets may become weaker, as they will be more likely to lose carriers and/or experience above average price increases. Humana, for example, seems to have positions in weak markets and is priced relatively low in many of them. Humana’s decisions about exiting markets so far suggest it may be seeking to reduce its presence in weak markets.